Before you configure your Frontoffice, make sure you have set up all of inventory and settings correctly. Refer to the Inventory and Settings categories for more information. How to set up your Frontoffice. 3. Choose which sub-setting you want to access. 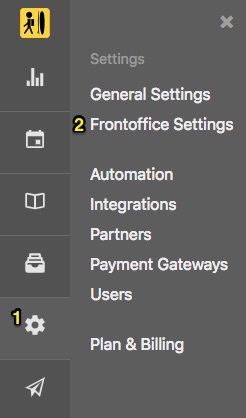 Frontoffice settings - an overview. Room combinations: used only in the case where all guests can not be accommodated in a single room, Bookinglayer will suggest to split the group across multiple rooms. This setting only applies to packages. Room transfers: When active, only in the case where all guests are unable to be accommodated in one room for the entire duration of their stay, Bookinglayer will suggest that guests transfer to another room during the period of their stay. The activity sub-setting allows you to define a cut-off time for when a customer can book your activities online. For example if you offer a yoga class at 10am, you may not want to accept online bookings for this class within 2 hours from the start time. disable your checkout (perhaps temporarily). Note that this setting overrules the confirmation setting (Automatic or Manual) of your inventory items. Tip: Try to keep your Booking Form as simple as possible to avoid having customers drop-off in the middle of the booking process. You can also send the Customer Portal URL any time after a booking is done, with all relevant fields you want your guests to fill out. You can customise the booking process with your own code. Please only use this section if you know what you are doing. Style your booking form with custom colouring and fonts. 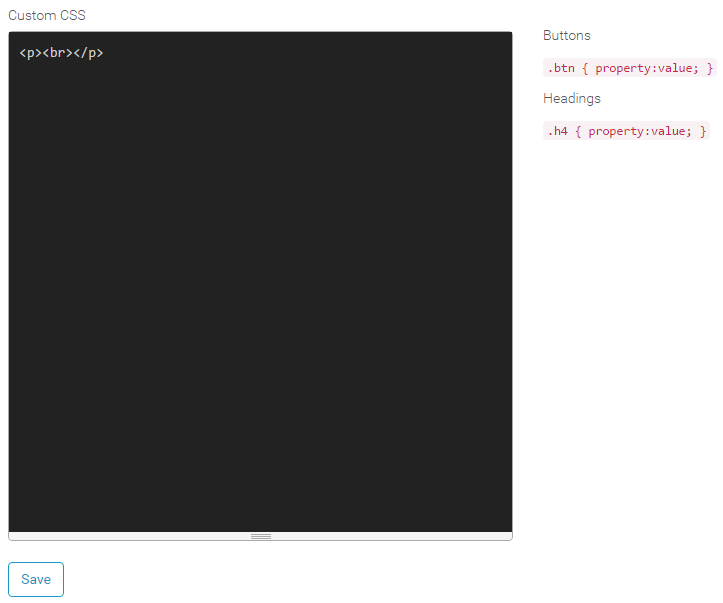 Please see this article for more information on CSS. 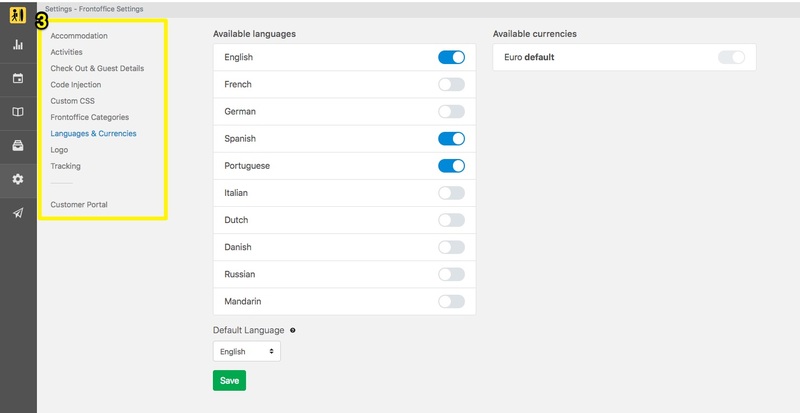 Select which languages and currencies you want to display on your frontoffice. Your default language and currency will be permanently set to "on". The languages you select should be in accordance with those offered on your website. 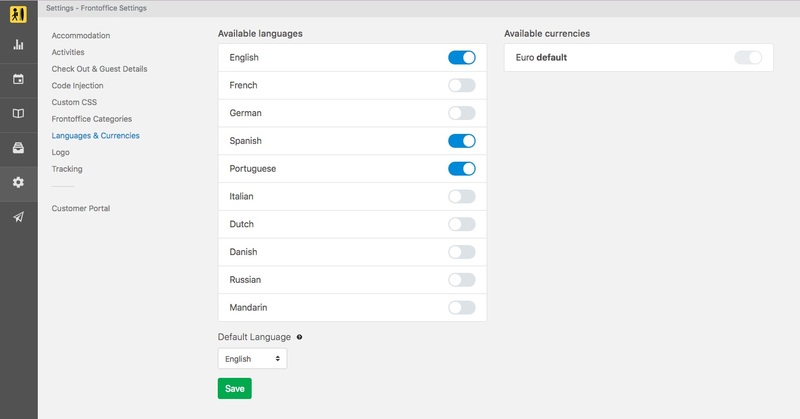 The available currencies will only display if you have already selected your currencies in the "General Settings" section. If your required different languages or currencies from the ones available, please contact our support team. Upload your company logo for this to show in the header of the booking form. If you use Facebook or Google advertising, you can insert your pixels here to complete the tracking cycle of your campaigns. This means that users coming through your Facebook and Google ads, then to your website, will also be tracked right through the booking process. See this article for information on how to setup Google Analytics pageview tracking. Arrival information - Form: You can set the form for arrival information as either visible or hidden, depending if you want your guests to fill out this information. If you set this to "Auto", Bookinglayer will track any products that are booked as a transfer, and automatically hide or show the transfer information according to the customer's booking. Payments and Invoices - Installed payments: When enabled, your customers can choose how much they pay toward their booking. Otherwise the default payment price will be your deposit or the remaining balance. Payments and Invoices - Invoices: Allow your customers to download their invoice from the customer portal. When hidden the customer will not see an invoice section.